Sterling Moore in action for the Raiders during the preseason. FOXBOROUGH, Mass. -- It might be no coincidence that, just a few days after the Patriots returned from Oakland, former Raiders cornerback Sterling Moore was added to the team's practice squad on Wednesday. Moore, an undrafted free agent out of SMU, earned high praise after a strong preseason in which he registered five tackles, a sack, and a team-high three passes defended for the Raiders. He landed on Oakland's practice squad at the start of the season, but was waived late last month. With the Patriots banged-up in the secondary, you can't help but wonder if Moore left an impression on the team's personnel department while reviewing preseason game film in advance of Sunday's win over the Raiders. Regardless, Moore was in the Patriots' locker room on Wednesday and excited for the opportunity, particularly given the injury situation that could thrust any practice squad member into an immediate active role. "That’s why I always try to stay ready and prepare like I’m playing this week," said Moore. "You’re always one injury away from being pulled up, so I'm preparing like I’m going to play, and making my reps count. When I do get that chance, I’ll be prepared." The 5-foot-10, 190-pound Moore sported an interesting pair of peg-like earrings and joked he wanted a little something different. Having spent most of his life on the west coast (he grew up in Northern California), he laughed about not knowing many guys in the Patriots locker room and admitted he's getting ready to acclimate to life on the east coast. Cornerbacks Leigh Bodden and Ras-I Dowling missed last week's game in Oakland, leaving the team thin at that position. 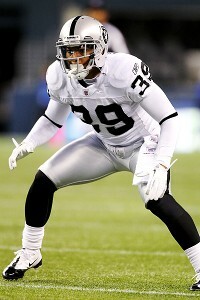 In releasing Josh Victorian to clear a roster spot, Moore is the only pure corner on the team's practice squad.